The following text and Image are Copyright Medical Media Images. 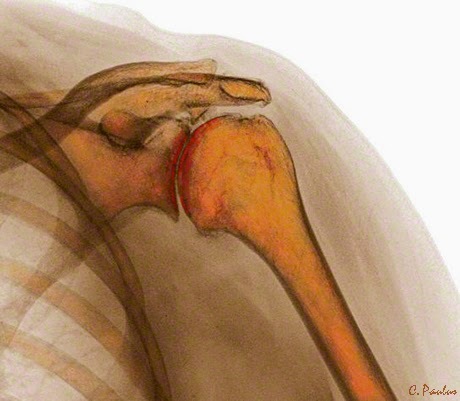 Medical Media Images has created a new Color X-Ray featuring Shoulder Joint Degeneration. 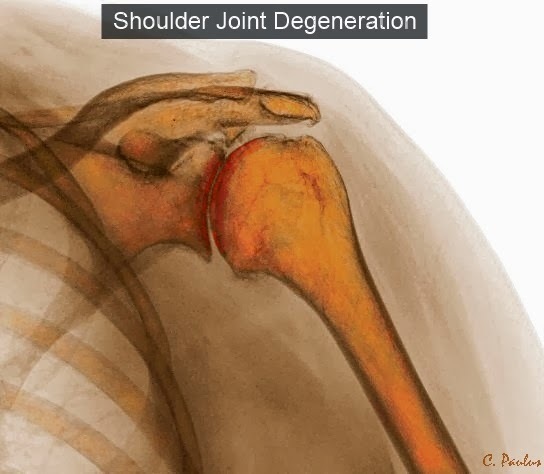 This Image shows Narrowing and Degeneration of a Shoulder Joint. This Image is Interactive. Move your Cursor over the Image and see the Interactive Tags come to life. Each tag displays text to explain a part of the Image. What Symptoms can a Lumbar Spondylolisthesis cause? How is a Lumbar Spondylolisthesis diagnosed? Patients often complain about frequent episodes of low-back pain, especially after bending forward and backward. Some patients have feelings of instability in the spine. 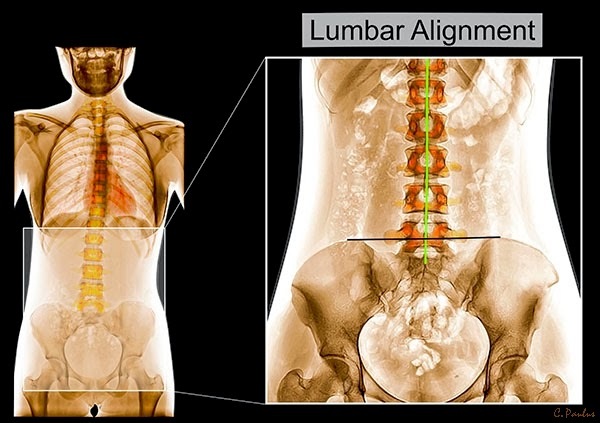 Spine imaging is usually the best way to diagnose a lumbar spondylolisthesis. X-Rays of the spine will show the bone anatomy of the spine. A shift between the vertebrae in a spondylolisthesis can be easily seen on an X-Ray from the side (lateral). Bending films, where X-Rays are taken with the patient bending forward (flexion) and backward (extension) can show if the spine is unstable and shifts back and forth. This Color X-Ray Image shows the Lumbar Spine (low back) from the side. The front of the Spine is to the left. The red dotted lines show a shift between the Vertebrae. This is called a "Spondylolisthesis". A CT-scan shows bone anatomy in more detail than an X-Ray. The spondylolisthesis shift can be clearly seen on a CT Scan. However since a X-Ray will show this as well, CT Scans are rarely necessary to make the diagnosis of a spondylolisthesis. The high dose of radiation also has to be taken into account. MRI scans can show a spondylolisthesis. They are often taken to see what kind of a problem the spondylolisthesis is causing inside the spine. 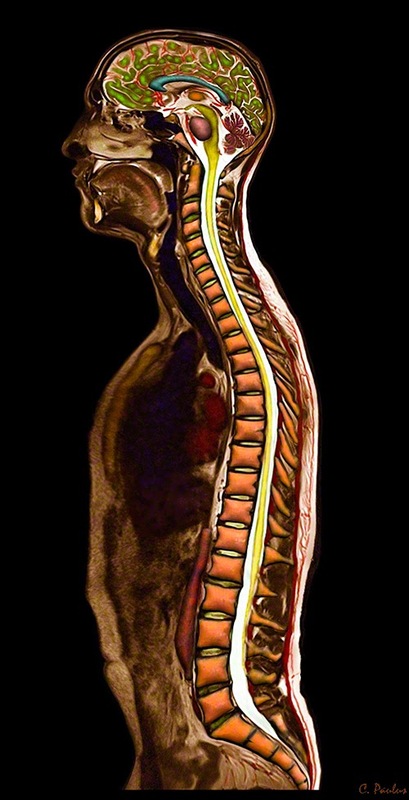 The discs, spinal nerves, spinal cord can all be seen on an MRI. The compression of the spinal nerve in the nerve channels can be clearly seen. This Color MRI Image shows the shift between two Lumbar (low back) Vertebrae. What are the Treatments for a Lumbar Spondylolisthesis? Alternative Health care options can often complement conventional medical care. Massage Therapy, Acupuncture, Meditation exercises and Herbal Remedies can all help with the pain from this condition. Massage therapy can help with the muscle part of the painful process from a spondylolisthesis. Chiropractic care including manipulation and adjustments of the spine can help with the pain and spasms from this condition. Spine exercises can help with the muscle pain and tightness from this condition. Exercise also increases the amount of oxygen delivered to the spine which can help with healing. Pilates, Yoga and T’ai Chi can help maintain the spine’s flexibility. PT has many modalities to offer for this condition. They can range from Manual Therapy and Exercises to Traction and Ultrasound Treatments. PT usually focuses on core strengthening techniques of the spine. Supporting and conditioning the core muscles of the spine can add stability and improve the symptoms. Self Help Tools are items which can be purchased to help with back pain. They range from Back Braces to Back Mattresses and Ergonomic Devices such as chairs and computer accessories. A spinal brace can be very useful in adding stability for patients who have an unstable spine where there is frequent shifting between the Vertebrae. Medical Media Images is proud to offer a new Color X-Ray Image: Cervical Artificial Disc Replacement (Prestige, Medtronic) which shows the Device's Motion in Flexion/Extension (forward and backward movement) of the Neck. Move your mouse cursor over the Image and see the Interactive Tags come to life! Each tag displays text to explain a specific part of the Image. Find more Color X-Ray and Color MRI Images at www.medicalmediaimages.com! This Image is an Interactive Image. Just move your mouse cursor over the Image and watch the Interactive tags come to life. Each tag will display text when you hover over it. What does "Lumbar Spondylolisthesis" mean? The word “Lumbar spondylolisthesis” is a combination of the Greek words “spondylos”, meaning “spine”, and “listhesis” meaning “slippage”. Altogether Lumbar Spondylolisthesis means a Slippage between the Vertebrae. One vertebra slips forward or backward on another. This slippage can cause nerve compression at that segment of the spine. Patients with this condition may experience a combination of back pain and leg pain. Does the Spine shift back and forth in a Spondylolisthesis? The condition of a spondylolisthesis can be divided into those which are stable versus unstable. In an unstable condition, the vertebrae can shift back and forth when the spine moves or with weight-bearing. Patients with an unstable Spondylolisthesis are more likely to have symptoms. Overall only a fraction of the patients who have a Lumbar Spondylolisthesis will be unstable. What happens when the Vertebrae shift in a Spondylolisthesis? 1. The discs are stressed since they are attached at the top and bottom sides of the vertebrae which shift. This can cause low-back pain, or even a disc herniation. 2. The facet joints in the back of the spine can be stressed and pulled apart. This can cause facet joint pain. 3. The foramen through which the spinal nerve travels often gets smaller in a Lumbar Spondylolisthesis. This can trap the spinal nerve and cause leg pain (sciatica). What are the different types of Lumbar Spondylolisthesis? These patients will be born with the condition. This condition is also called a “dysplastic spondylolisthesis”. Children are born with a spinal malformation which causes a shift between the vertebrae. This is a rare condition. This type of spondylolisthesis occurs as a result of a spondylolysis (link) defect. This is the most common form of spondylolisthesis. It occurs in approximately 5-7% of the population. This type develops as part of an advanced degenerative process of the spine. Typically, the facet joints on the back of the spine become arthritic and form large bone spurs. These bone spurs then begin to push the vertebra forward, causing the shift. Due to severe spine trauma. Part of the vertebra can be pushed forward due to the force on the spine. Due to a spine cancer which weakens the vertebra. How is the Severity of a Lumbar Spondylolisthesis determined? A slippage of over 100% means that one vertebra is now completely in front of another. This condition has its own name, spondyloptosis. Medical Media Images has created a new Interactive Image: Color Reference MRI demonstrating Cervical Spinal Stenosis. This Image also contains a whole body Reference MRI to orient the viewer. The Interactive Image tags help explain the relevant parts of the Image with text. Enjoy learning from this Image! Move your mouse cursor over this Image and see it come Alive! Interactive Color X-Ray Image of Degenerated Knee Joints! Medical Media Images presents a new Interactive Image: Color X-Ray of Degenerated Knee Joints. This Interactive Image showcases the disease of Degenerative Joint Disease (DJD) of the Knee. The Interactive Image tags explain the relevant Anatomy. Move your Mouse Cursor over the Image and enjoy learning from the text which each tag displays! New Color X-Ray showing Knee Joint Degeneration! Medical Media Images has created a new Color X-Ray Image featuring Knee Joint Degeneration. This Image shows the narrowed knee due to a loss of cartilage. Arrows point to the narrowed parts of the knee joint. 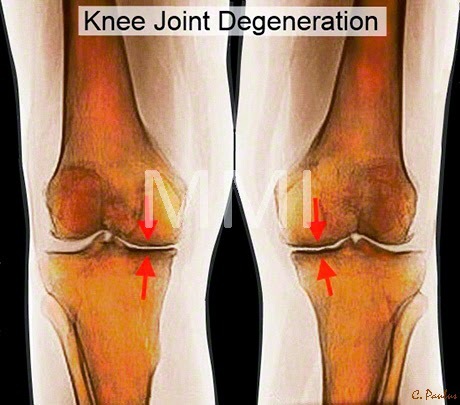 This Image allows anyone to know at a glance what a degenerated knee joints looks like. Medical Media Images has created a new Interactive Color MRI Image showcasing Cervical Degenerative Disc Disease. A Reference Color MRI Image is included to orient the viewer to the whole body. The Interactive Image tags explain the relevant Anatomy with text. Move your mouse cursor over the Image and see the Interactive tags come alive! New Color MRI Image featuring Cervical Degenerative Disc Disease (Disc Degeneration in the Neck). The following Image and text are Copyright Medical Media Images. 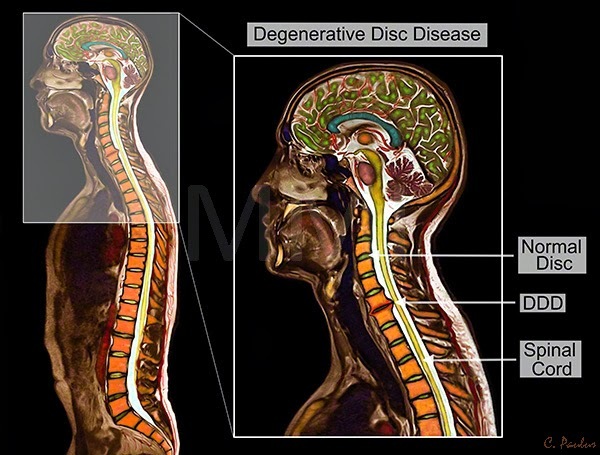 Medical Media Images has produced a new Reference Color MRI Image showcasing Cervical Disc Degeneration. This Image also shows a Reference to the whole body to orient the viewer easily. 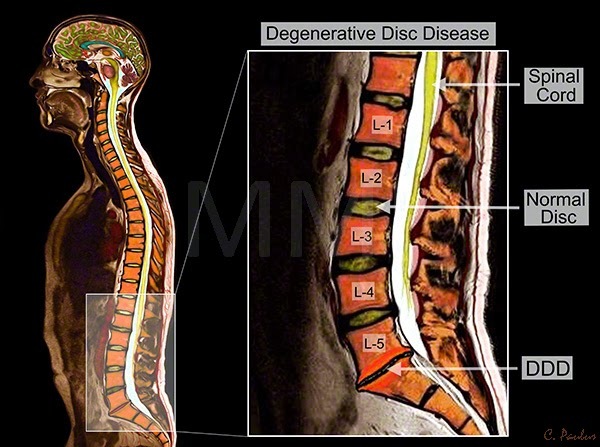 This Image shows Degenerative Disc Disease (DDD) at the C6/7 Disc. Medical Media Images has created a new Color MRI Images showcasing Lumbar Degenerative Disc Disease (DDD). This Image shows a Reference to the whole body to allow the viewer to understand the relationship to the body. Annotations are provided for the most pertinent part of the Anatomy. 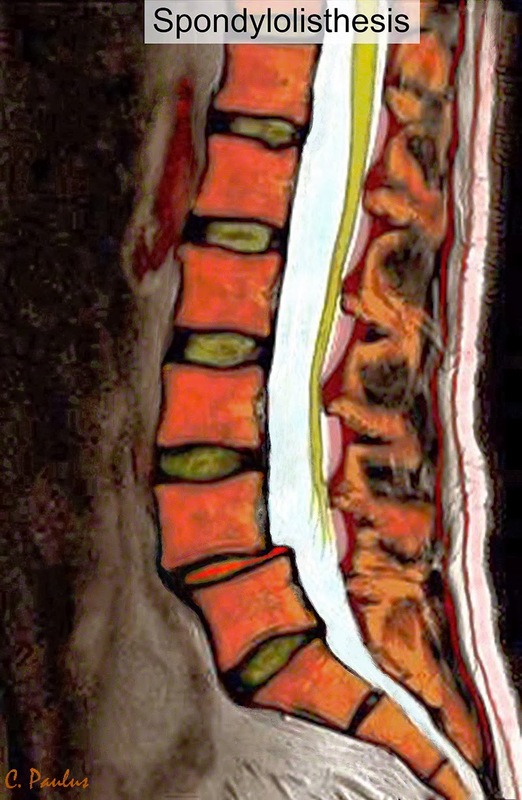 This image shows Degenerative Disc Disease (DDD) at the lowest Disc of the Spine. The Vertebrae of the low back are numbered. Medical Media Images presents a new Interactive Color MRI Image demonstrating a Lumbar Spondylolisthesis (shift between the Vertebrae). The whole body Reference MRI provides a perspective to the whole body. The Interactive Image tags explain the condition and other Anatomy with text. Interactive Color MRI of a Cervical (Neck) Disc Herniation Created! Medical Media Images has created a new Interactive Image. 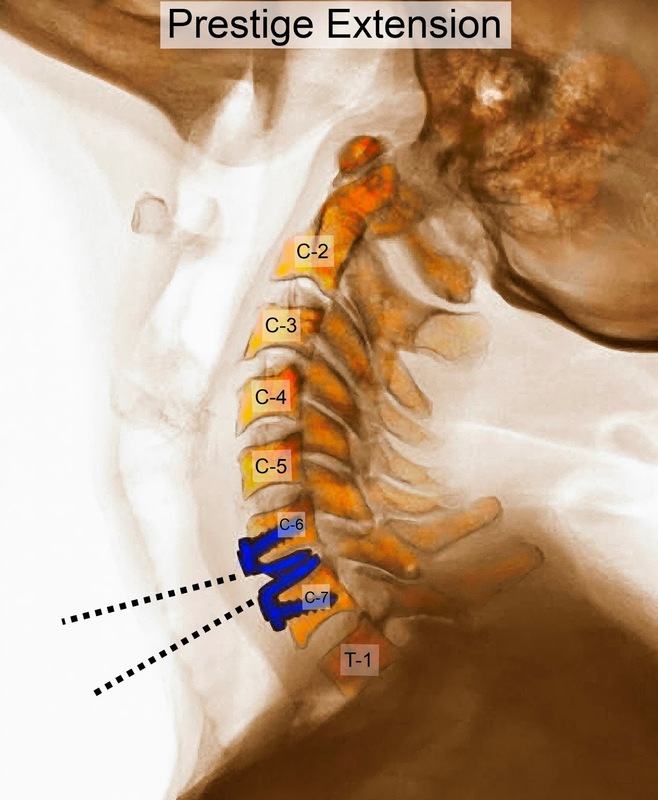 This Image showcases Disc Herniations in the Cervical Spine (neck). The large whole body Reference MRI provides perspective. 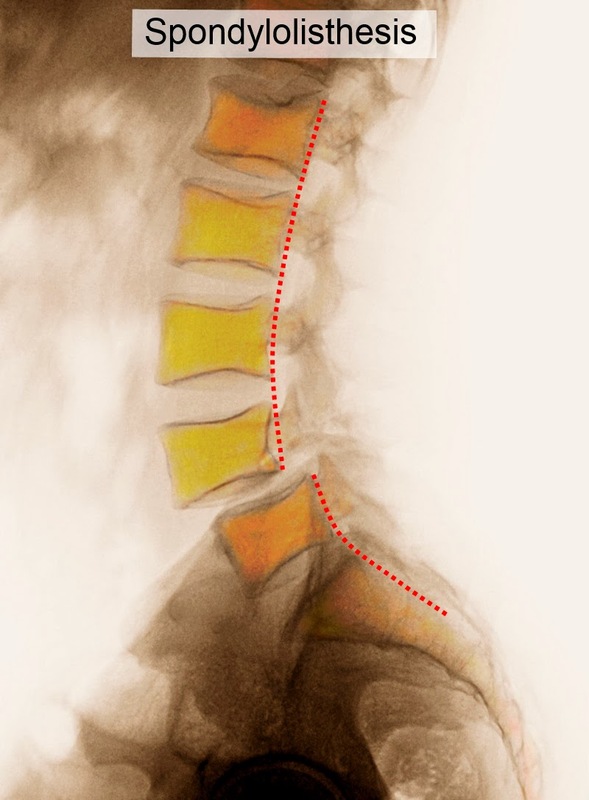 The Interactive Image tags explain the Disc Herniation and other relevant Anatomy with Text. Move your mouse cursor over the Image and see the Interactive Image Tags come to Life! Medical Media Images has created a new Interactive Reference style Color MRI Image featuring a Kyphoplasty Procedure. This Image allows the viewer to understand the relationship of the main Image to the rest of the body by providing a whole body Color MRI as a reference. The Interactive Image tags display text to explain the main parts of the Anatomy and Kyphoplasty Devices. The Kyphoplasty balloon is shown inflated inside a L-3 Compression Fracture. This Image is a powerful visual educational and learning tool. Interactive Lumbar Compression Fracture Color MRI featured. Medical Media Images is showcasing a new Interactive Color MRI Image. This Image demonstrates a Lumbar Compression Fracture. The Reference MRI shows the area of the Body the main Image pertains to. The Interactive Image tags bring the Image to life. Each tag explains a particular part of the Image with rich text, allowing the viewer to learn all about the Image. Enjoy learning from this Image. If you move your mouse cursor over the Image, Interactive Image tags come alive. Each tag explains a relevant part of the Image. 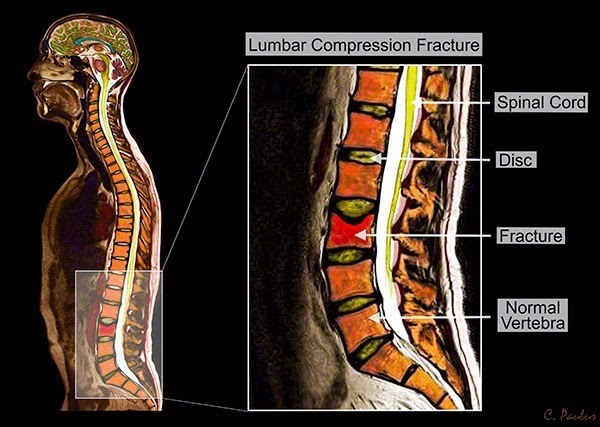 Medical Media Images has created a new Reference Color MRI Image showcasing a Lumbar Compression Fracture. This image is meant to educate audiences ranging from the public to specific patient groups and medical audiences. The Reference MRI provides an easy understanding of the part of the body shown in the main Image. This Reference MRI shows a Lumbar Compression Fracture in Red. Medical Media Images presents a Color X-Ray featuring a Prestige Disc Replacement Device in Extension. This image showcases the Prestige's ability to provide motion in extension. Patients and Health Care Professionals can now appreciate how an Artificial Disc Replacement can provide motion. The black dotted lines accentuate the visual information provided. 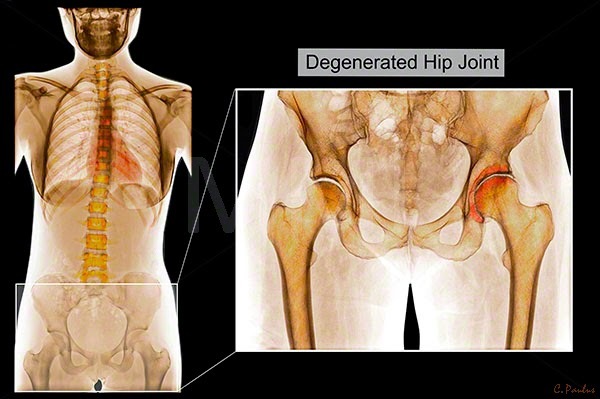 Degenerative Hip Joint Disease: A new Reference Color X-Ray created! 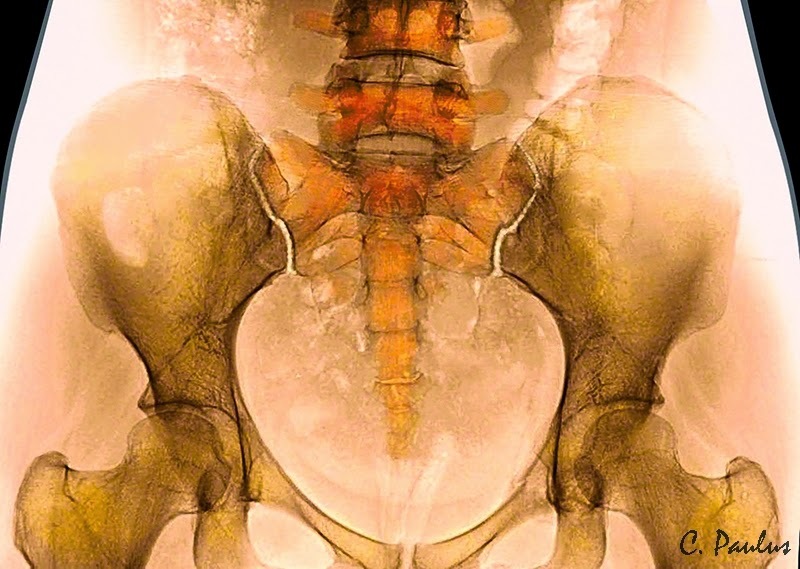 Medical Media Images has created a new Color X-Ray featuring Degenerative Hip Joint Disease. This Reference style Image shows a whole body reference Color X-Ray to show where in the body the main Image is taken from. This fosters an immediate understanding of the part of the body the X-Ray pertains to. The main Image shows a degenerated Hip Joint. 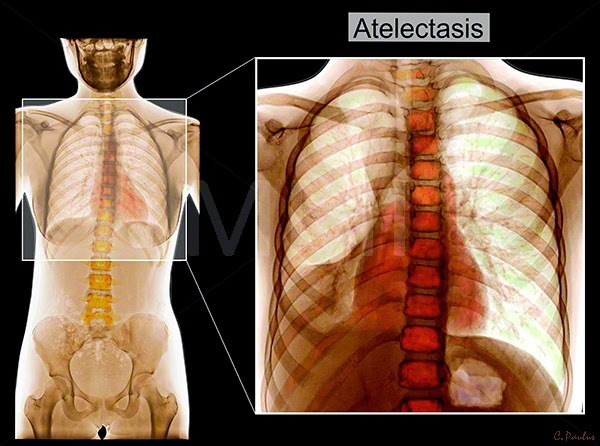 Medical Media Images has created a new Reference Image: Atelectasis. This Image shows a whole body X-Ray to provide a perspective as to what are of the body the main Image pertains to. The main Image is a Chest X-Ray which shows Right Lung Atelectasis. This condition represents a partial collapse of a lung segment often due to hypoventilation (lack of full respiratory effort). This condition is often seen following surgery. Medical Media Images creates new Image: A Reference Color X-Ray showing the Lumbar Spine Alignment. This Image consists of a whole body X-Ray as a Reference and features the main Image as a "cut-out". 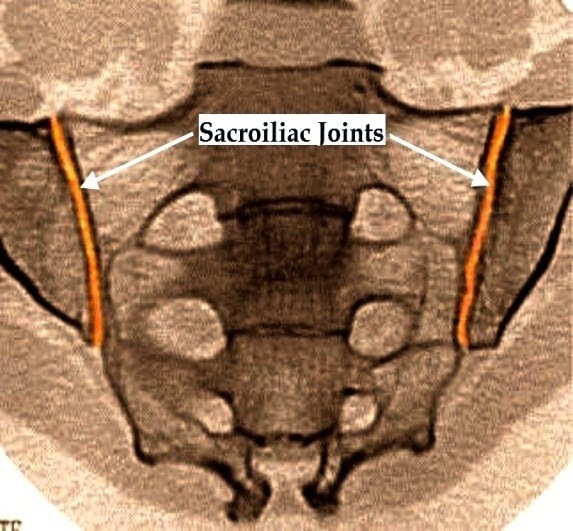 How do Spine Specialists make the diagnosis of Sacro-iliac Joint Dysfunction? The Image is an Interactive Image. Move your mouse cursor over the Image and see the Interactive Tags come to life. Each tag displays text to explain a specific part of the Image. In severe and acute cases of sacriliitis, a patient will come to the doctor with fevers and severe pain in the low back/buttock area. They will often have a strong limp, and very little mobility of the hip. These patients may have a recent history of infection. With the more chronic type of sacroiliac joint dysfunction, the patient will complain of nagging pain in the low back/buttock area and have a difficult time with stair climbing or standing. Some of these patients will have a history of trauma to the pelvis, a type of arthritis, or previous pregnancy. X-Rays will show the sacroiliac joints. However, they often will not show a problem with the joint until a sacroiliac joint dysfunction or sacroiliitis is very advanced. It can take 10 years or more for that to be the case. This Color X-Ray Image shows the Sacroiliac Joints in white. They are located between the Pelvis (Hip Bone) and the Sacrum (Tail Bone). CT-Scans can show the anatomy of the sacroiliac joint very clearly and with better quality than an X-Ray. However, similar to X-Rays it may not show a problem until it is advanced. The CT scan also does not show inflammation in the joint. MRI scans can show swelling and inflammation in the joint when special MRI images are taken. These are called STIR (Short Tau Inversion Recovery) images and those taken with intravenous contrast (Gadolinium). Both can show inflammation in the Sacroiliac Joint. A nuclear bone scan can show severe inflammation in the form of activity in the joint. However, bone scans are usually not taken for sacroiliac joint dysfunction. To diagnose a sacroiliac joint dysfunction or sacroiliitis, a doctor can inject the joint with the help of an X-Ray machine. Often a local anesthetic combined with an anti-inflammatory medication such as a steroid is injected. The patient is then evaluated for pain relief. This is a blood test which looks for elevated White Blood Cells and other more specialized cells (i.e. Neutrophils) which can be elevated in infection. This blood test looks for severe inflammation. This test also looks for severe inflammation. How is Sacroiliac Joint Disease Treated? Alternative Health care options can often complement conventional medical care. Massage Therapy, Acupuncture, Meditation exercises and Herbal Remedies can all help with the pain from this condition. PT has many modalities to offer for this condition. They can range from Manual Therapy to Exercises and Ultrasound Treatments. Mobilizing the joint and strengthening the muscles around the joint are frequent ways Physical Therapists will treat sacroiliac joint inflammation. Joint mobilization techniques can be manipulation, stretching and exercises. Self Help Tools are items which can be purchased to help with back pain. They range from Back Braces to Back Mattresses and Ergonomic Devices such as chairs and computer accessories. A specific Sacroiliac Belt is also available. This Image is Interactive: Move your mouse cursor over the Image to learn from the Interactive Tags.